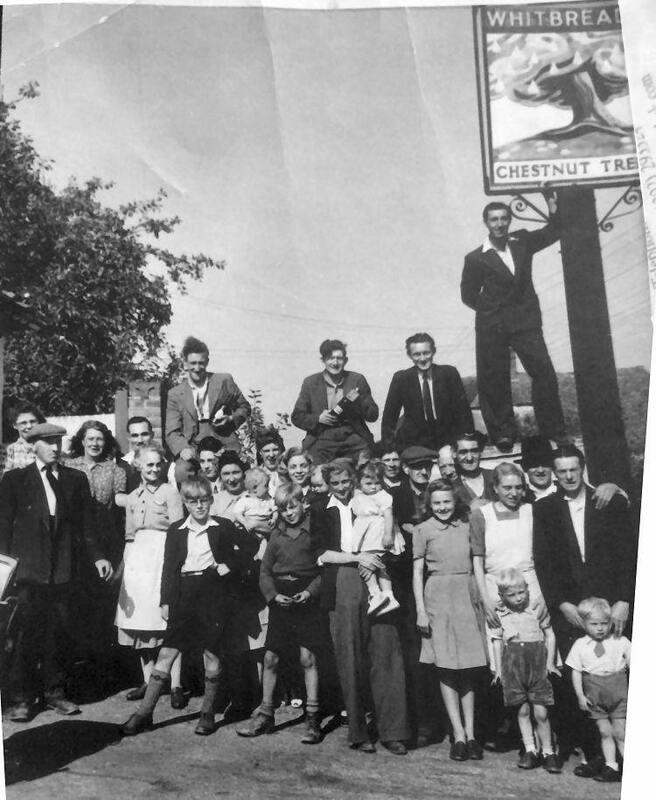 Above photo showing a family in the late 1940s, hopping outside the "Chestnut Tree." Kindly sent by Jean Lawrence. Above aluminium card issued May 1949. Sign series 1 number 39. This actually had a Walnut Tree planted outside, whilst the "Walnut Tree" had a Chestnut tree outside. The building gained a Grade 2 listing on 14th October 1987. The pub is unfortunately closed (date unknown) and is now a private residence. It is said to be of 18th century build with later additions, timber framed, clad with blackened weatherboarding to front, tile-hung to right gable end. Plain tile roof. South facing, built at right-angles to road. 2 storeys and garret. Gabled, with projecting brick gable-end stacks. Irregular fenestration of 2 three-light wooden casements. Low single-storey addition to left gable end. Rear lean-to. Single-storey pebbledashed addition to right gable end, facing road, with hipped plain tile roof, gable end stack, two sashes, central half-glazed door, and blocked doorway towards right end. From Sussex Agricultural Express 18 August 1888. About 1 1/2 miles from Yalding Station, S.E.R. - TO BLACKSMITHS', WHEELWRIGHTS', AND OTHERS. Messrs. Langridge. Have received instructions to sell by auction, on the premises, on Wednesday, August 29th, 1888, at Eleven o'clock, the whole of the Stock in Trade of a blacksmith and wheelwright, at the "Chestnut Tree," Congelow, Yalding. COMPRISING:- Smith's bellows, forges, anvils, stocks and dies, wrenches, gate irons, skin pans, grindstones, quantity of tyre and bar iron, sundry smith's tools, oak, ash, elm, and other planking and board, spokes, felloes, wheels, gate materials carpenter's tools, etc., etc. 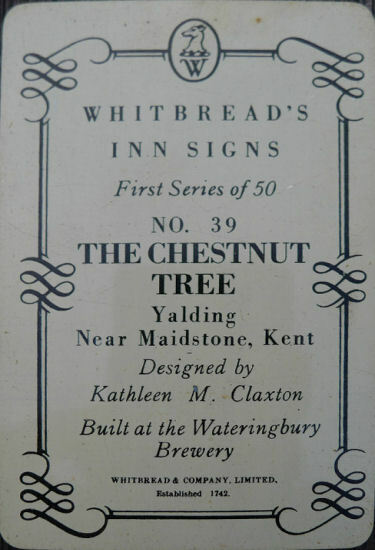 May be viewed the day previous and morning of sale, and catalogues can be had at the "Chestnut Tree," Yalding; and of Messrs. Langridge, Estate Agents and Surveyors, Tunbridge Wells, and 28, Queen-street, London, E.C. From the Kent and Sussex Courier, 28 October 1892. Monday.— Before the Hon E. V. Bligh (in the chair), Colonel Luck, and Major Bailey. 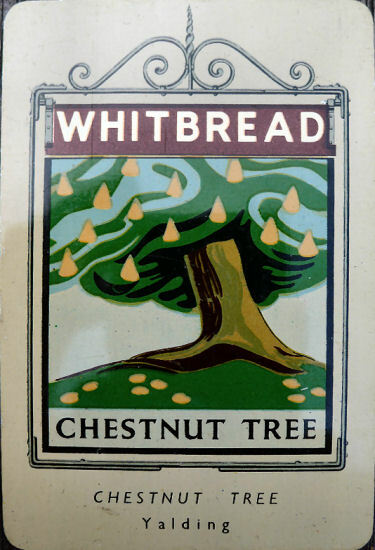 On the application of Mr. W. S. Norton, the licence of the "Chestnnt Tree." Yalding, was transferred to William List from Thomas William Clarke. From the Kent and Sussex Courier, 21 January, 1916. 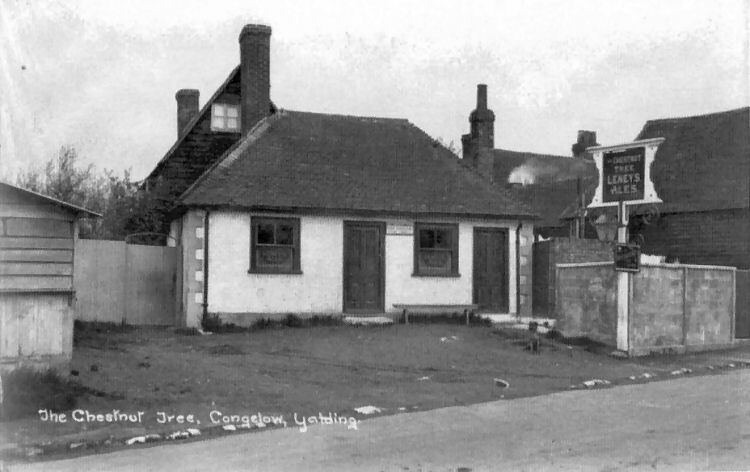 At the Mailing Petty Sessons on Monday the following Yalding licenses was transferred:—The "Prince of Wales Inn," from Henry Hatch to James Chapman; and the "Chestnut Tree" beerhouse to Emily Noakes.